The Internet is packed with investing related information. There are so many websites out there offering information that it is difficult to find which ones are actually worth your time. Proper education on the topic can lead to significantly higher returns for your own personal investment portfolio. While some websites focus on specific investment areas, others niche down on specific sub-niches. 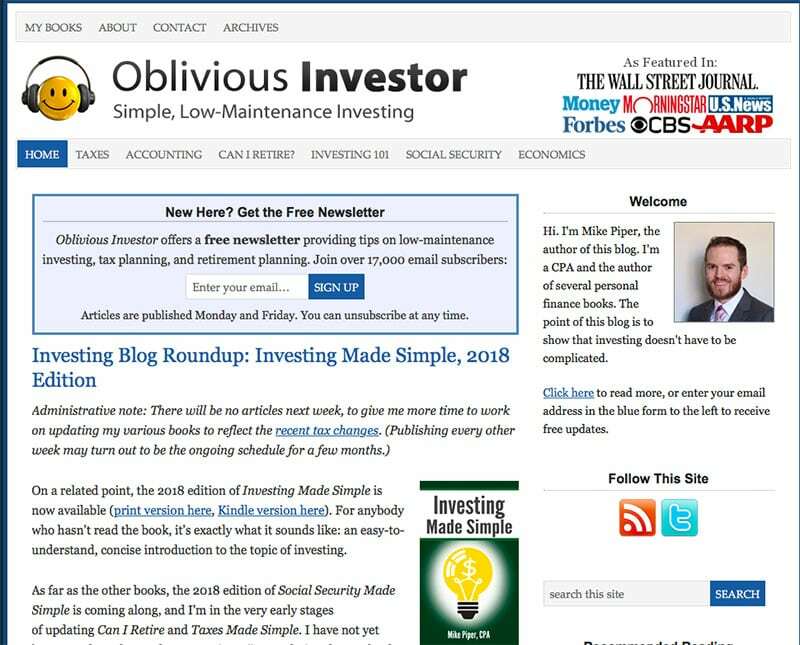 We have taken the time to analyze some of the industry’s top investing blogs that you should definitely check out if you’re interested in how to better run your personal finances and invest more wisely and effectively. The list is not in order of superiority. All blogs featured offer a wealth of knowledge and are definitely worth the investment of your time. Summary: TCI is a specialized investing blog that addresses both student loan debt and investment needs. The blog is created and run by Robert Farrington. It truely is a valuable resource that helps you, as a student, to dig yourself out of your debt burden and start building wealth. The blog is packed with valuable resources including a course on how to get out of student loan debt and how to invest. The blog also provides you with various free tools for managing your finances. 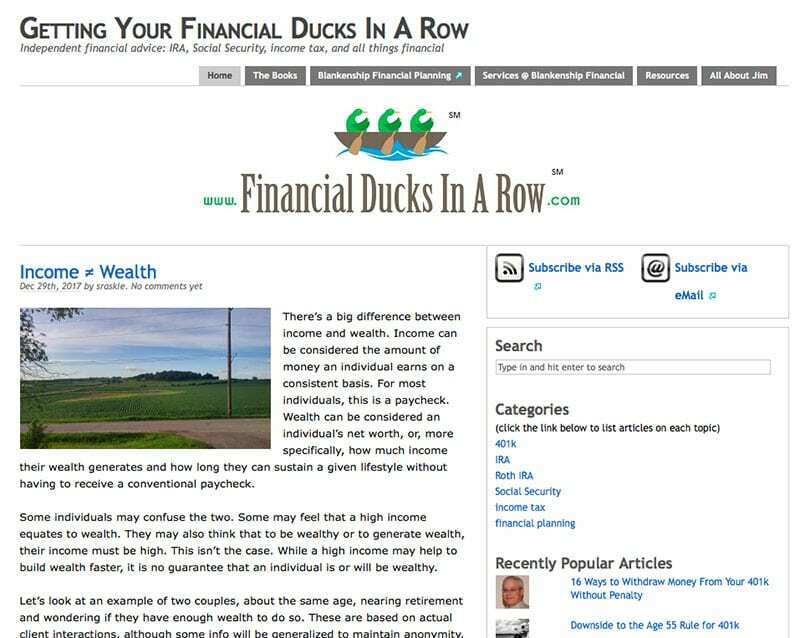 One great thing about the blog is the fact that you can subscribe to receive regular financial tips. You can also directly ask questions from the author and use him as your financial consultant (in reasonable amounts that is). 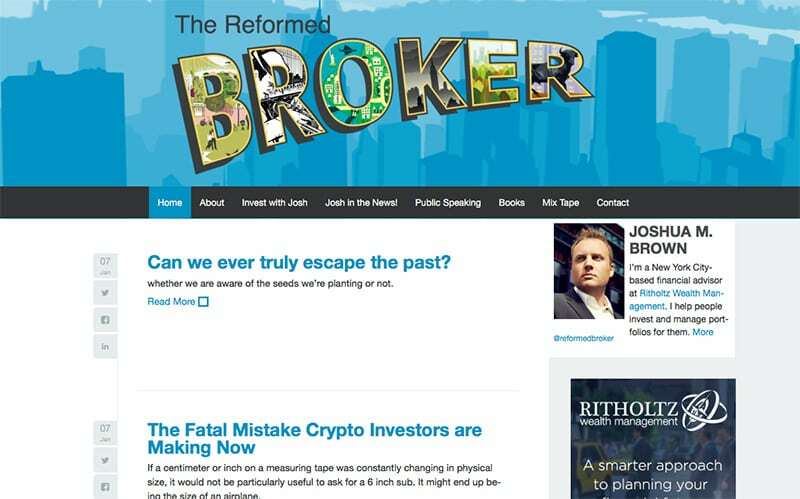 Summary: The Reformed Broker is a blog by Joshua Brown, the CEO and financial advisor at Ritholtz Wealth Management, an investment firm based in New York City. Brown is also the author of various helpful books including Clash of the Financial Pundits and Backstage Wall Street. The blog is the place to go to if you are in need to align your investments with your financial goals. 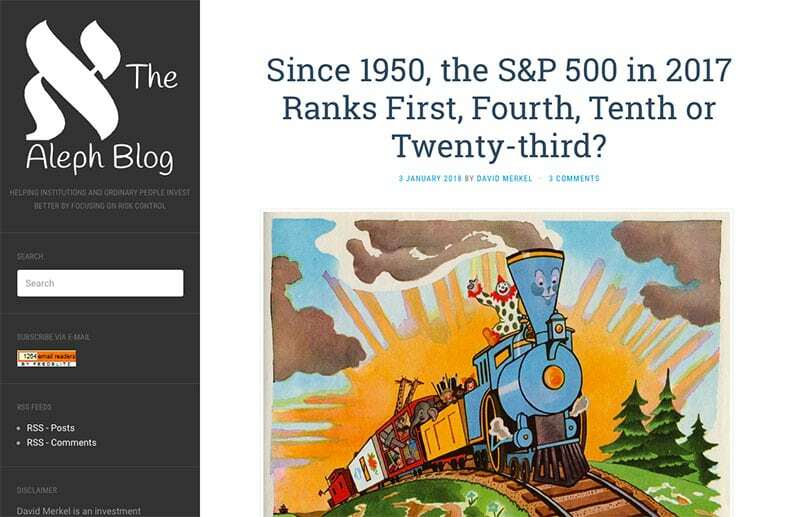 The blog serves individual, established, and corporate investors alike. The site is packed with useful financial content that you can use to manage your finances as well as invest more wisely. 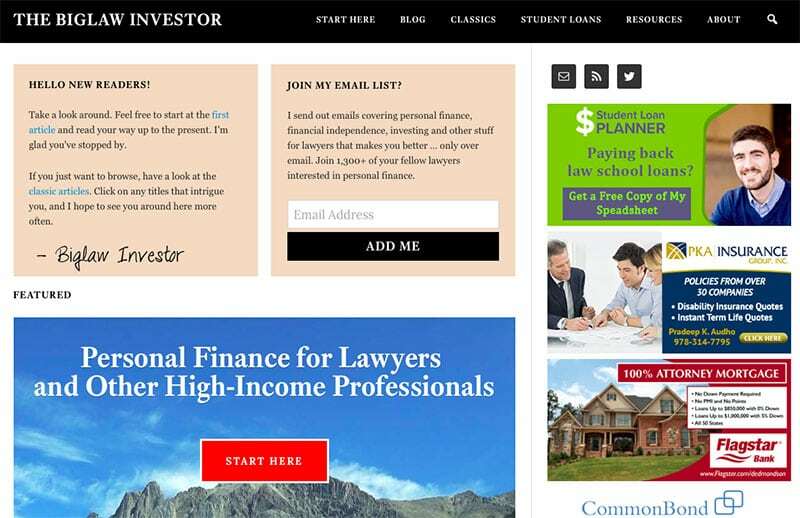 While using the blog is free, using the full service of the investment firm is fee-based. The author has delivered numerous talks to audiences across the nation and abroad. 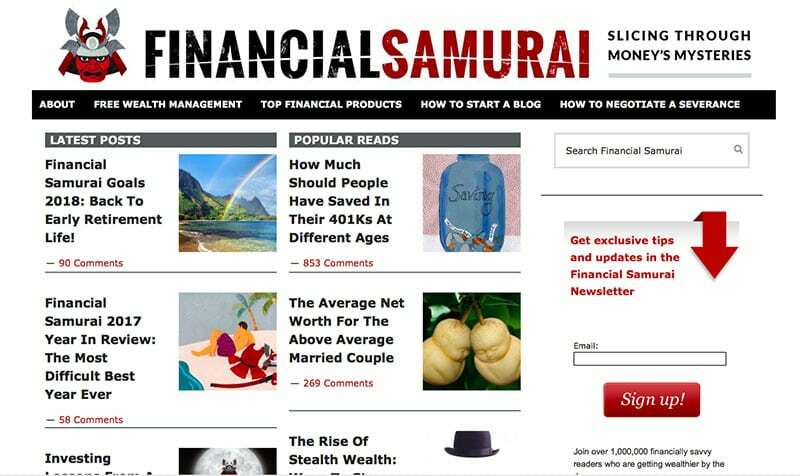 Summary: The Financial Samurai is a unique blog, created by Sam Dogen, a financial veteran who started to blog out of personal experience in financial issues. This is a go-to blog when you need to learn general investing knowledge. It also delves into real estate investments, provides tips on retirement planning and career strategies. Furthermore, using the blog also introduces you to some of the free best financial calculators, wealth management vehicles and the latest investment opportunities. Another cool feature is that you can engage with the author directly through email on any financial issue. Sam is open to answer all questions that his readers may come accross in order to provide maximum value to his audience. 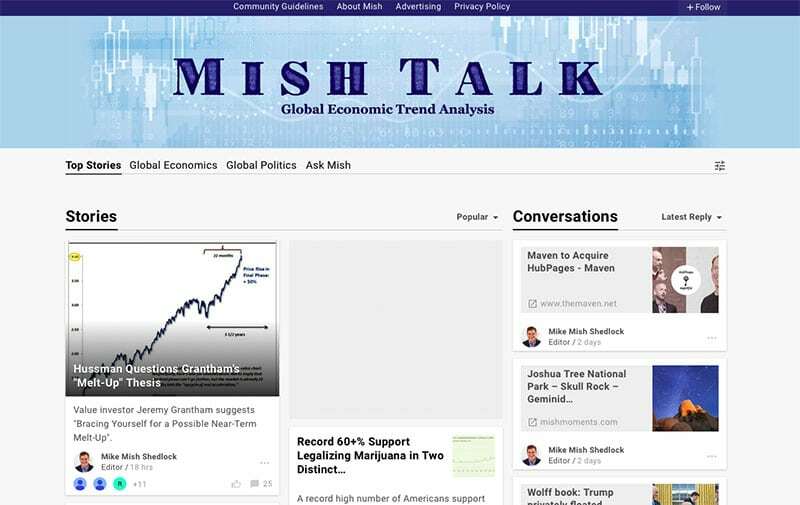 Summary: You should be able to find Mishtalk a blog of its own kind. It is a community-based blog put together by Mike Shedlock aka Mish. Mike is a stock and economy enthusiast and writes widely on related issues and topics. He writes on a daily basis giving advice and insights on policies by the central bank and interest rates. Mike follows the Austrian Economic perspective in his writings. 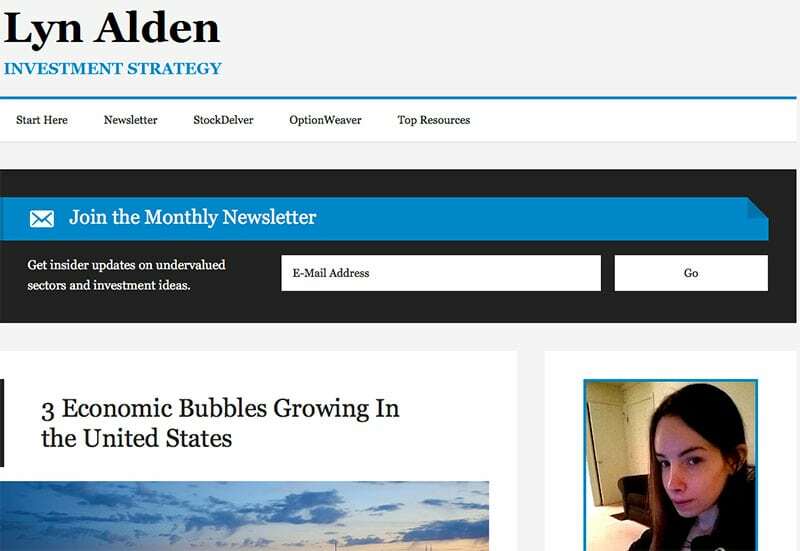 You should find articles on the blog very useful especially on such issues as the current status of the economy, jobs, and dealings in precious metals. The fact that the blog is community-based is a plus. You can take advantage of this opportunity to interact with other community members on any financial issue. The forum is heavily moderated to ensure high quality information. Summary: This is a simple and straightforward blog put together by Indian Suresh KP. However, behind that simplicity is a wealth of financial knowledge. My Investment Ideas is an educative blog that you can use to obtain valuable financial knowledge. 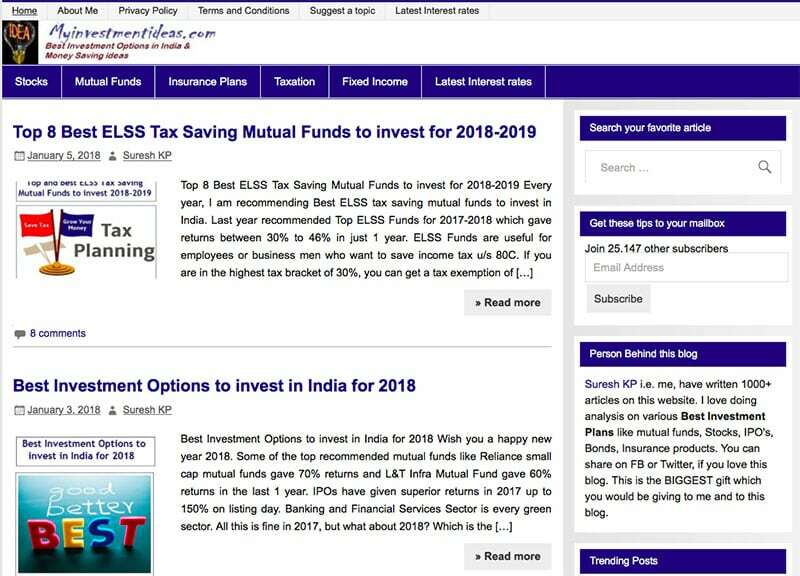 With over 15 years of experience in the financial investing and planning niche, Suresh has written over 1,000 articles that are available on the blog. The author also provides valuable money-saving tips and recommendations on the best investments opportunities. Similarly to other blogs, you can post questions on related topics on the blog to receive tips and advice on the issues that matter to you. 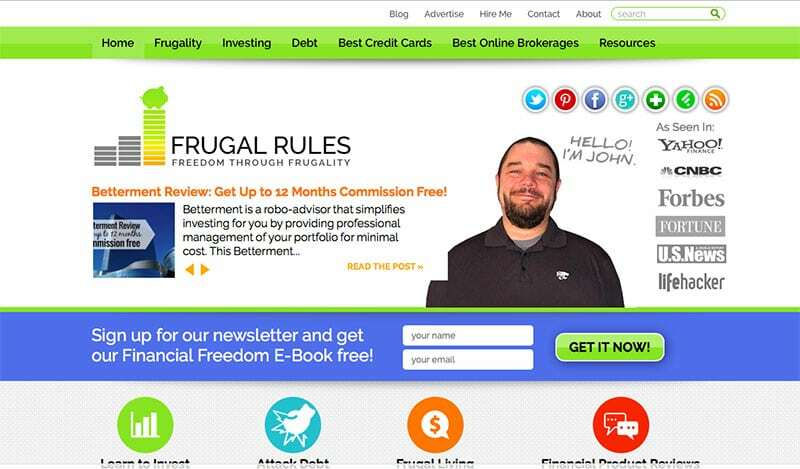 Summary: The Frugal Rules blog is suitable if you are a beginner in the investing world. However, you should also find it useful if you are an established investor. The blog is authored by a veteran in the financial services industry and offers valuable investment and money-making tips. 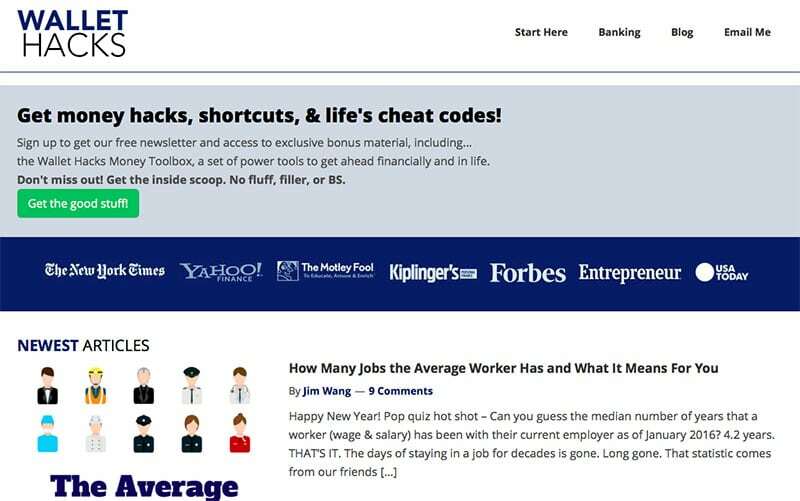 It is a go-to blog if you need to learn about useful money-saving tools available to you. The blog also provides insight and advice on some of the best brokerage firms that you can choose for your investment ventures. Yea, you can easily find free financial tips, but finding ways on how to attain financial freedom can be hard. You receive a financial freedom E-book by simply signing up for the monthly newsletter. Summary: This is a valuable blog if you need to manage your finances at a personal level. It has been put together by two professionals with a wide experience in different industries. The blog provides you with a wide range of tools that you can use to manage your finances effectively. DQYDJ is suitable whether you are a beginner or a professional. One thing you will appreciate about the blog is its well-researched content. As analysis and economic issues are not everyone’s cup of tea, the blog includes links to visualisations to bring home difficult ideas for people from all backgrounds. Some of the tools that you should find beneficial include economic, personal finance, investment, financial, and demographic calculators together with their visualisation presentations. 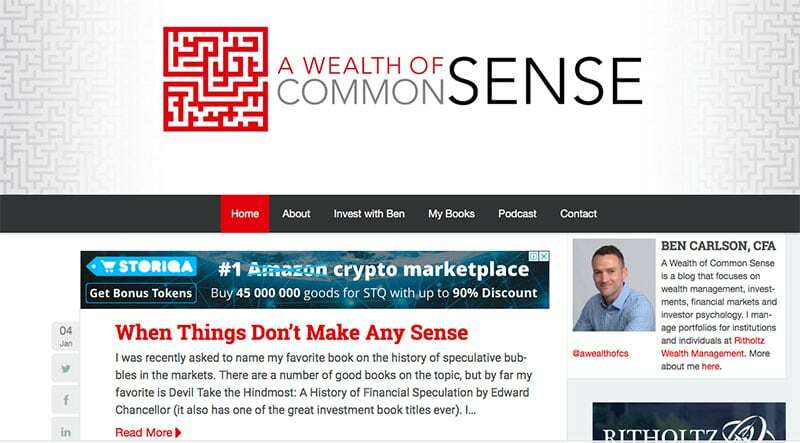 Summary: A Wealth of Common Sense is a blog by Ben Carlson – a professional in the financial industry. He is the Institutional Asset Management Director at Ritholtz Wealth Management. Carlson is also the author of Organisational Alpha and A Wealth of Common Sense, two financial books that are very educative. In addition to the financial knowledge and reports available on the blog, you also benefit from podcasts that address various financial issues. You can also engage Carlson to plan your finances or on how to invest your money. Summary: This is another blog that is simple but full of valuable financial information and advice. The blog is by Mike Piper, a St. Louis based licensed CPA who has authored a good number books on personal finance. In addition to providing insights into tax issues, the blog provides valuable lessons on accounting, economics, retirement, and investment topics. The blog was created to simplify financial issues and you should find the content and advice provided easy to implement. Furthermore, you can subscribe to receive free investment and personal finance management tips on a regular basis. Summary: Investing Haven is a blog of its own kind. Indeed, its content is peculiar. 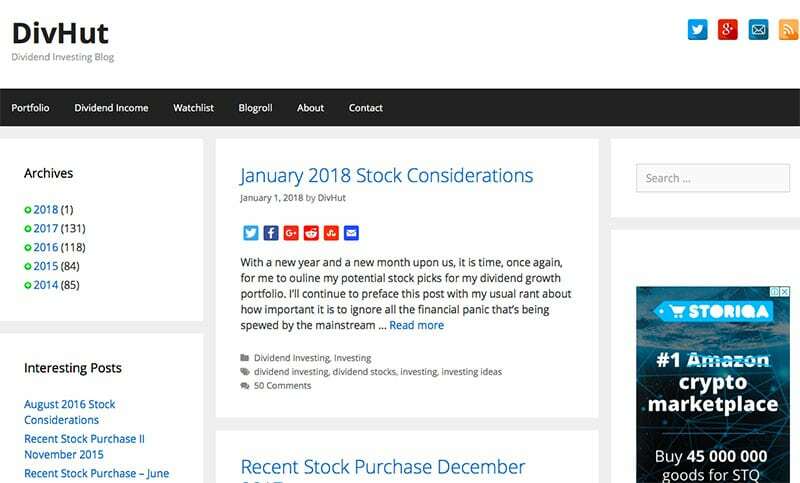 Noting that there was a tsunami of content related to financial issues, Taki Tsaklanos created the blog to help both beginners and established investors get a deep insight into everything to do with the financial markets. Investing Haven provides forecasts on varied financial markets including that of precious stones and also stock markets. The blog also provides insight into market trends, which can be a good guidance in order for you to make your own investments. 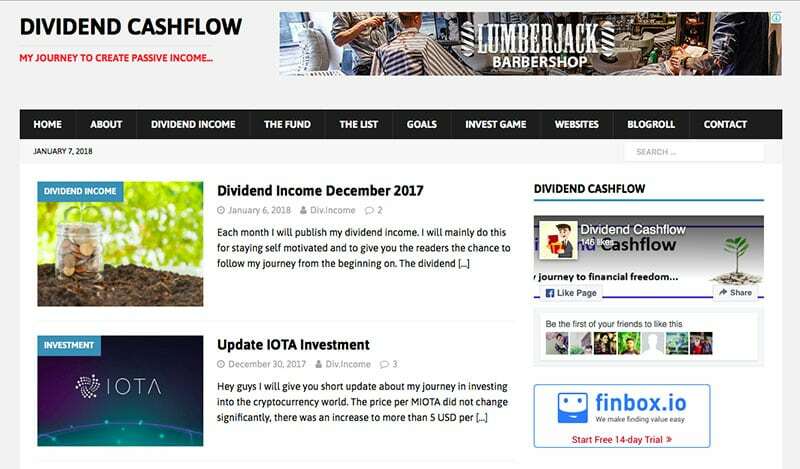 Summary: The blog was created by five young men who believe that sharing their investment knowledge publicly helps people across the world. Although there are five people behind the site, the name of the blog is actually borrowed from Clint Fuhs’s “Fifth person perspective” research paper. The creators do not only provide investment advice and tips but are also dedicated investors themselves. While you can use the blog to gain useful financial knowledge, you also have the option of registering as a member. 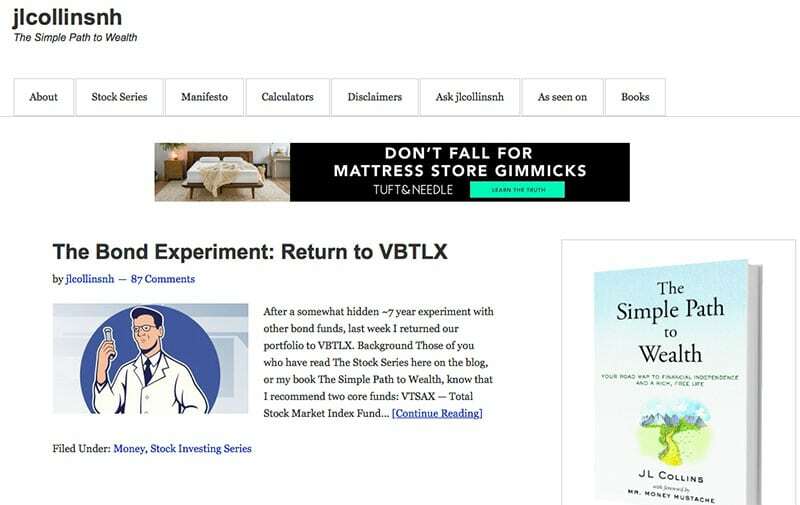 Your membership to the blog’s Alpha Lab entitles you to two stock investment ideas and a video covering relevant companies. Summary: Old School Value should be a bookmarked blog if you are an already established investor. The blog was created by a group of eight people with expertise in different fields including financial research. In addition to providing you with insights on financial markets, the blog also provides you with actionable tools that you use to analyze varied stock data before investing. The tools available speed up the time you spend to get relevant data and information. Using the blog also gives you access to its rating system that you may use as a guidance to interpret important stock market indicators. The good thing about using the blog is the fact you have access to a pre-built excel spreadsheet with formulas that analyze data. This makes it easy for you to make informed investment decisions. Summary: If you are in search of a life, money, travel, and business blog then this should be the blog to read. The blog is by Collins, a cosmopolitan executive and regular publisher of both fiction and non-fiction books. 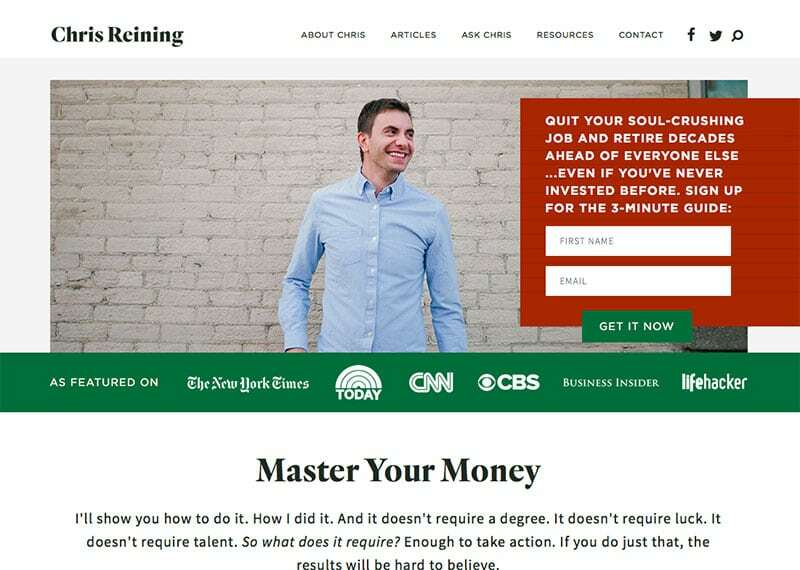 Having performed some of the most humbling jobs you can imagine, rising to the top to work for some of the most notable companies in the world, Collins has a wealth of financial knowledge and experience that he shares openly on the blog. In addition to stock market information, you also have access to financial calculators that you can use for your benefit. You can also choose to subscribe to receive regular financial tips and updates. 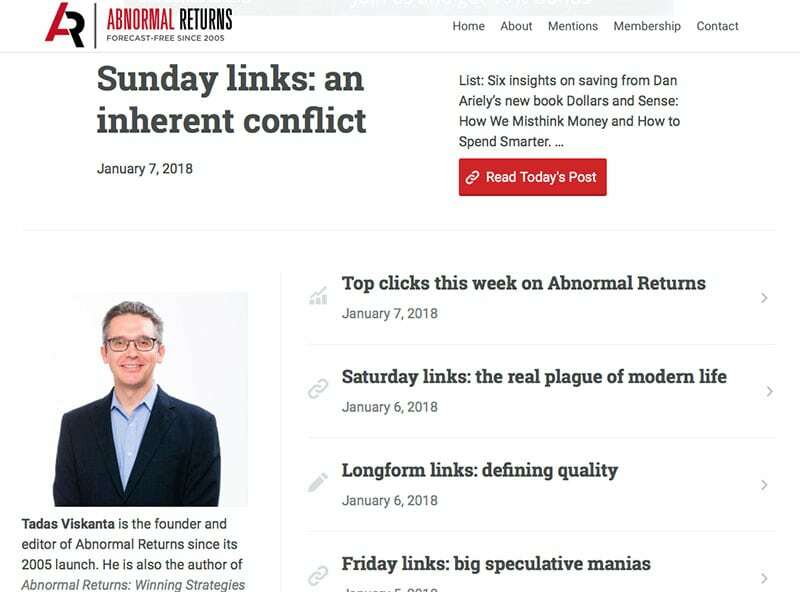 Summary: Abnormal Returns is a blog by Tadas Viskanta, a private investor with over 20 years of investing experience. He is also a Finance Instructor at Butler University. Abnormal Returns places at your disposal the latest financial information and content that makes it possible for you to make informed investment decisions. However, the blog is not only used by investors. You can also use it to gain financial literacy. The site is packed with numerous financial articles. Although you can read posted content, effective use of the blog requires membership. The blog has three membership categories with membership fee ranging between $30 and $75. 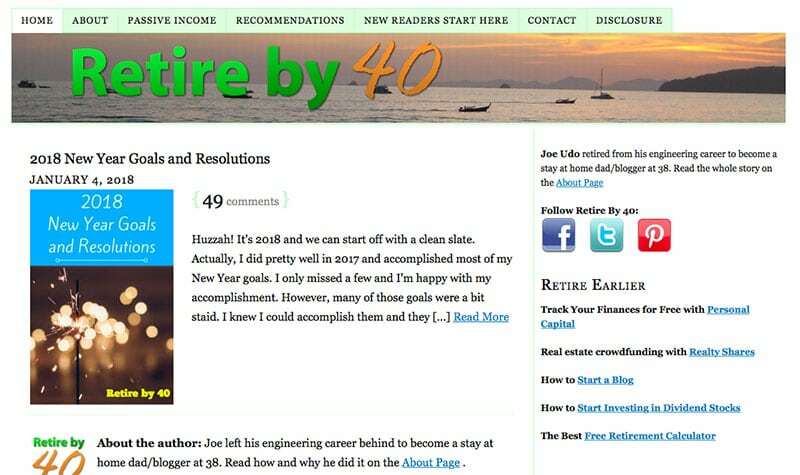 Summary: This is a personal blog by Joe Udo, a retired engineer, dad, and an investor. Through his blog, Udo addresses the fears associated with retirement and in particular, early retirement. Writing from a personal experience having retired early at the age of 38, Udo addresses all the fears you may have should you choose to retire early. He also goes the extra mile to address some of the financial issues you are most likely to encounter years after your early retirement. In addition to explaining how he earns a living now, you also get to know how to invest wisely. You also find his recommendations on the best credit cards and personal finance products. 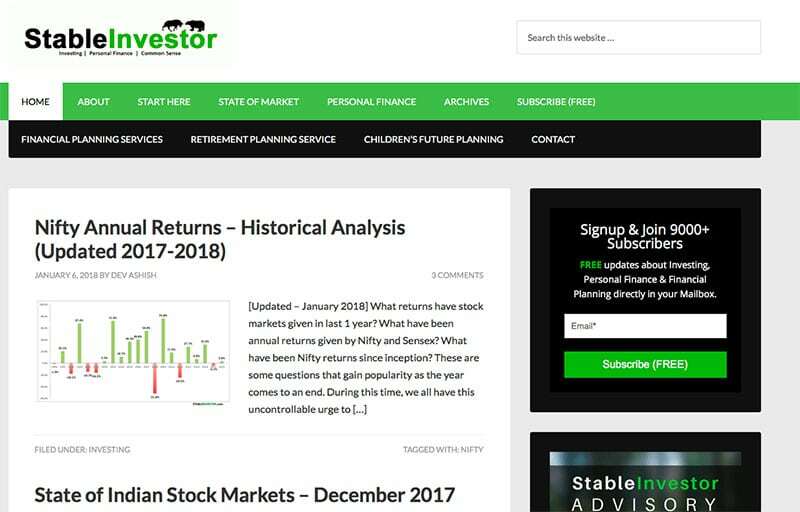 Summary: This is a valuable blog to either follow or subscribe to receive regular investment updates. 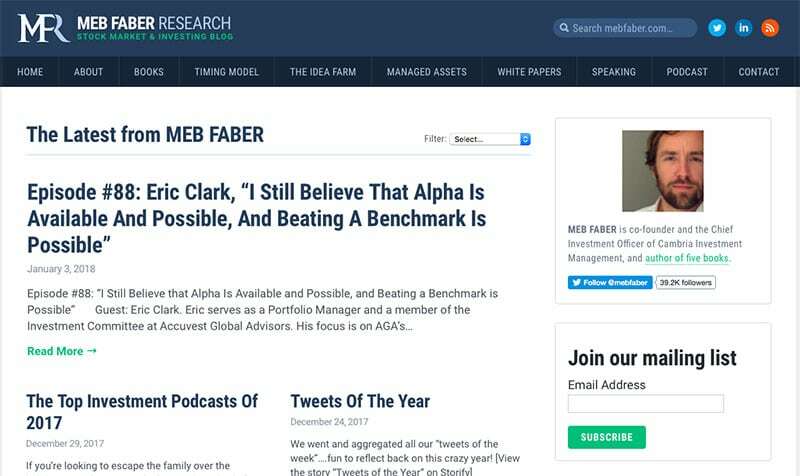 It is a research, stock market, and investing blog put together by Meb Faber, the co-founder and Chief Investment Officer at Cambria Investment Management. The blog provides you with numerous investment articles written by Faber in the form of white papers. 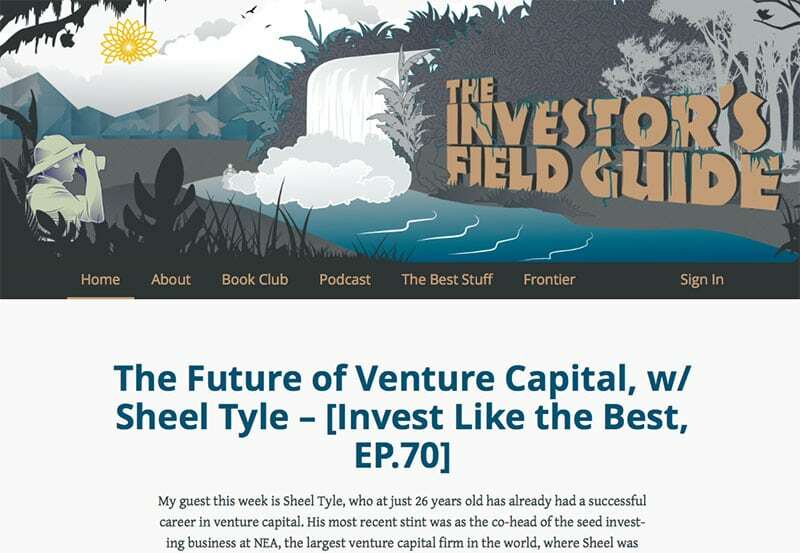 Using the blog also gives you access to useful investment suggestions and ideas by Faber in the form of episodes. I really love the fact that the blog covers different types of investment including macro investing, ideas on how to find valuable stocks and investing into equities, buybacks, dividends, value stocks and currencies. 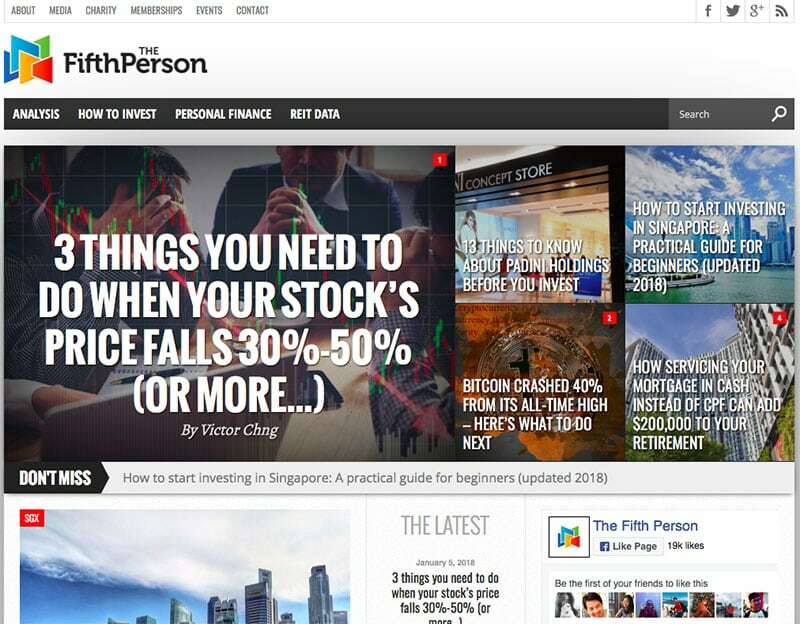 Summary: Consider this as an investing blog that suits established investors. 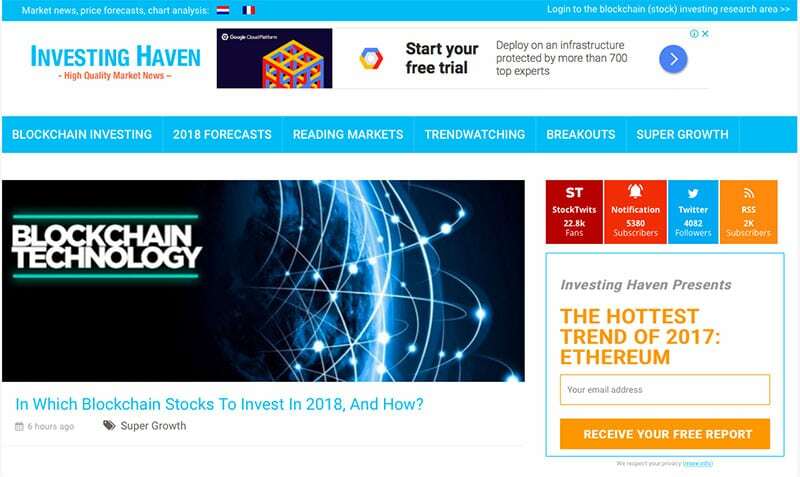 Indeed, the blog is promoted as a “safe haven for investors”. The blog is by Jason Zweig, the former senior writer for Money magazine and also a personal finance columnist for The Wall Street Journal. 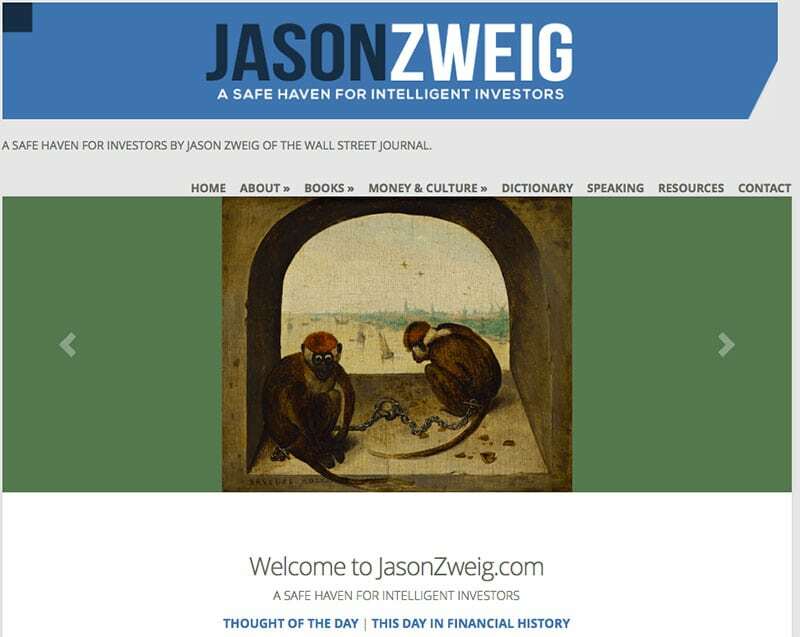 Using the investing blog also introduces you to Zweig’s books that he has written over the years. All the posts on the blog are by Zweig himself. They provide you with detailed investment research findings and recommendations. You should find the resources available on the blog useful accompanied by relevant resources. 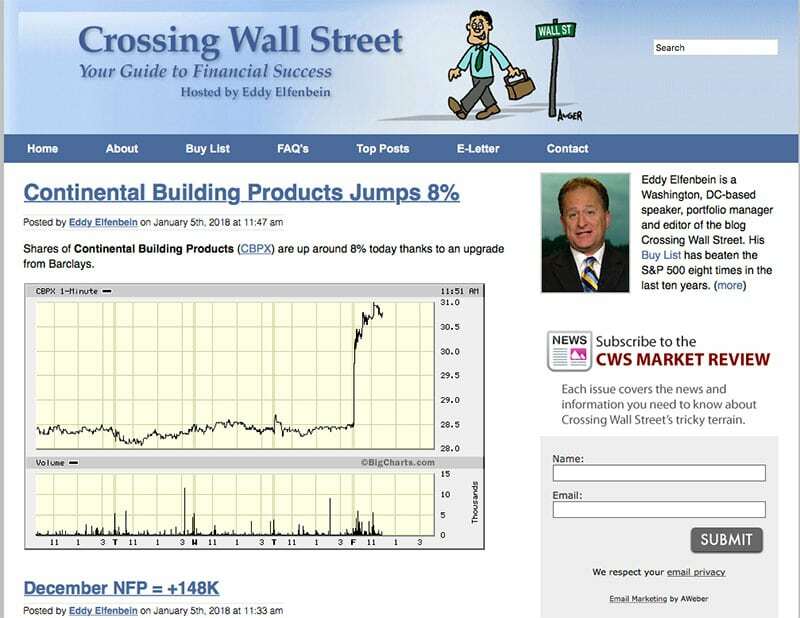 Summary: Crossing Wall Street blog is the place to go to if you are an individual investor. It is by Eddy Elfenbein, a person passionate about everything to do with the stock market. With the belief that the stock market is a consistent investment vehicle, Eddy provides you with valuable insights and trends, enabling you to make the right investment decisions. Another special feature is that Eddy provides a yearly buy list of stocks that he finds worthwhile to look into. Summary: Just as the name suggests, consider this as your field guide on issues related with investing. It is an informative investing blog by Patrick O’Shaughnessy, the portfolio manager at O’Shaughnessy Asset Management firm. One unique thing about the blog is guest posting by reputable investors and professionals in the investing world. The posts provide you with detailed insights into investment trends. You should find the blog’s Book Club useful. The reviewed books cover a wide range of topics that should are definitely beneficial. Summary: Receiving dividends on a regular basis would be nice, now wouldn’t it? This investing blog is one of the top blogs thatyou need to follow for detailed dividend investment advice. The blog is by Keith Park, an expert in the field of dividend investing. 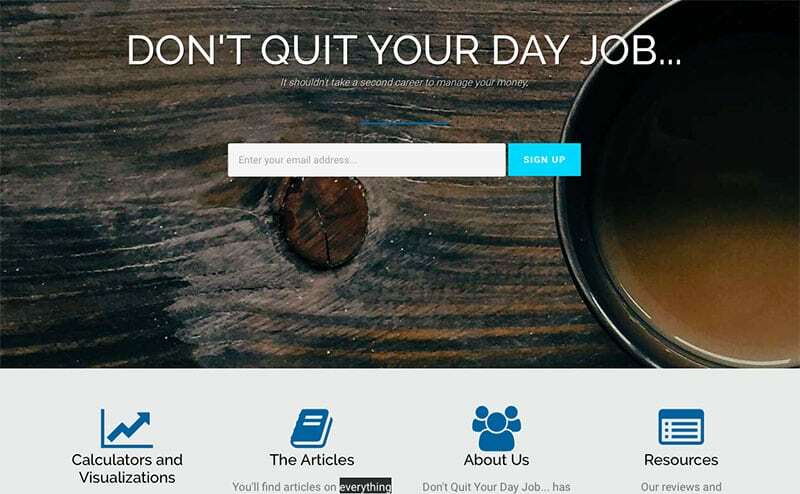 Divhut has numerous posts by guest bloggers. You should find these articles beneficial in providing you with relevant dividend investing ideas and suggestions. The blogger covers various investment areas including stocks, real estate, cash saving, and peer-to-peer lending to name a few. Summary: This is an investing blog by a regular investor. The blog is all about how to achieve financial freedom through dividend investing, something that the owner himself does regularly. 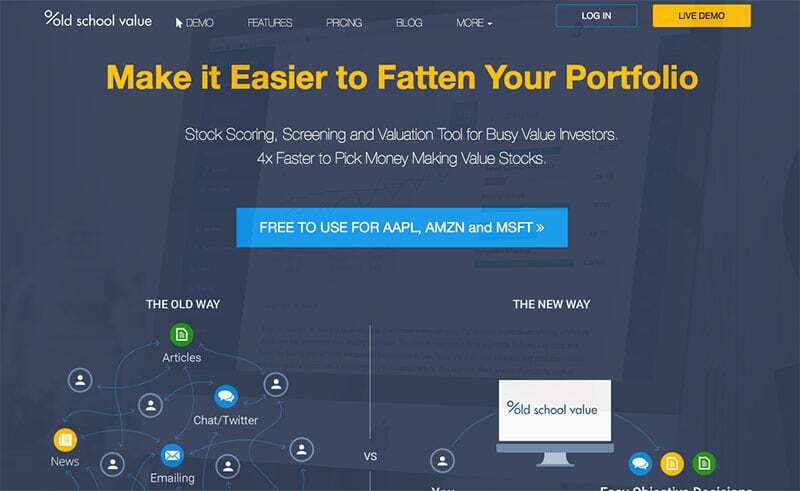 One cool feature is that the blogger shows his latest investment portfolio publicly. The main aim of the blog is to demystify the notion that you cannot receive significant income through dividend investing. The blogger also posts in-depth articles on stock investment analysis. 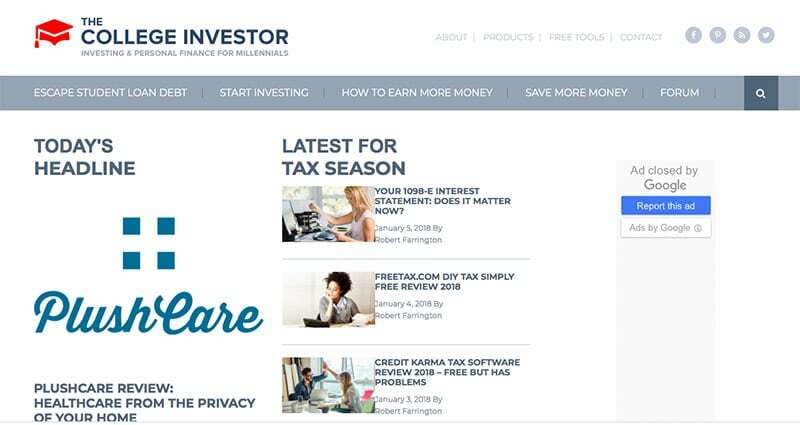 Summary: This blog should be your one stop shop on all matters to do with income tax, social security advice, IRA and other financial issues. The blog is by Jim Blankenship who is an independent paid financial planner. The blog is rich in discussions that cover different financial matters. The blog also has a lot of resources covering investing and retirement topics. In addition, Jim will direct you to other useful sources that will help you with the above mentioned topics. Summary: Investing should never be a struggle, at least according to Chris Reining, the author of this blog. This is not surprising considering that he held on to his regular job, worked, put money aside and invested his way towards the first million. This is something that Reining teaches how to do through his articles. Reading the articles introduces you on how to save, how to invest your savings to build wealth and achieve financial independence. In addition to the articles, the blog also provides you with useful resources including books on investing, financial calculators, coaching, and a much more. Summary: Real Investment Site is exactly what it’s called. 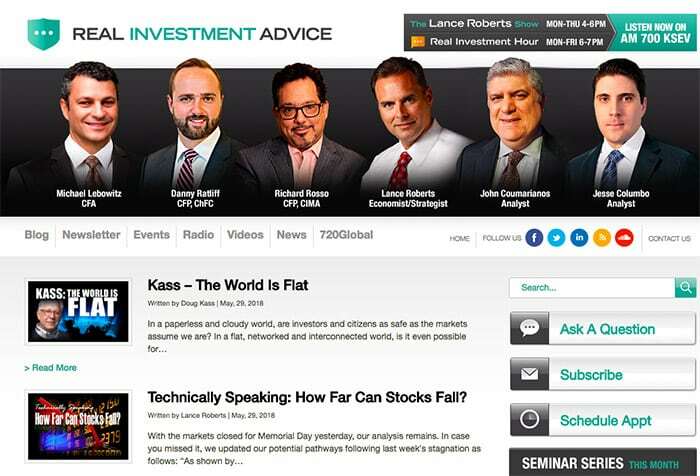 It’s a proper investment website covering the latest market related news and super interesting opinionated market commentary by various authors. The site offers valuable information in various content forms including blog posts, videos, radio shows and webinars. At the time of writing this, I am currently participating in a retirement investing seminar. Summary: There is no business without risks. However, that does not mean that you should avoid engaging in entrepreneurship and investing. It is the measures you put in place to prevent risks that matter the most. That is the message you get from this blog. The blog is created and run by David Merkel, an experienced investment professional with a wide experience in the financial industry. He provides advice to both individuals and institutions on how to invest wisely by focusing on risk control. Summary: The Marc to Market is one of the high end investing blogs. The blog is by Marc Chandler, a prolific writer, publisher and associate professor at the New York Center for Global Affairs. 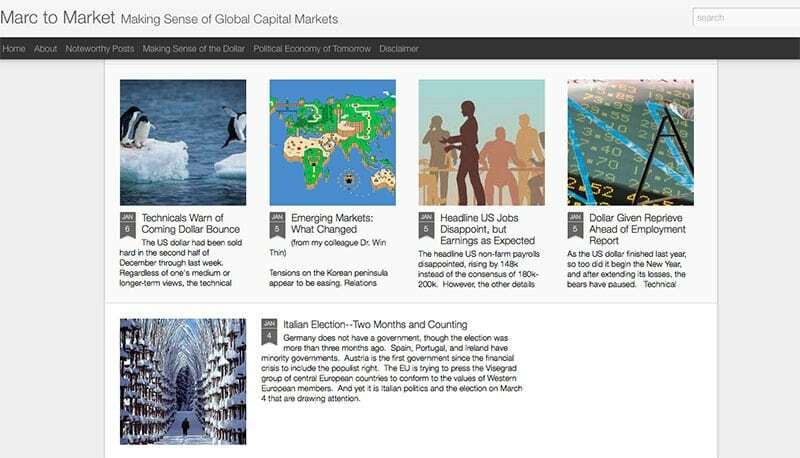 Indeed, the blog is all about global capital markets. Reading the blog enlightens you on how to make sense of your money while remaining conscious of the effects of political events across the world. Summary: This should be your preferred investing blog if you are already an established investor. The blog is by Lyn Alden, an experienced economics, financial modelling, and resource management expert. The blog focuses on research in the financial field. Studying the site provides you with high quality research backed findings and information on how to build wealth and invest wisely. 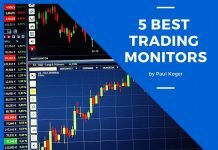 Summary: This is one of the best investing blogs to use if in search of money management techniques. It is a simple yet highly useful personal finance blog by Jim Wang. The blog introduces you to the unconventional strategies that you can use to improve your financial life. The blog contains strategies covering money-building systems, life, how to save, and how to spend wisely. The blog also provides you with banking information with suggestions on the best banks and online banks to consider. Summary: Stable Investor is an awesome blog that helps you to invest more wisely to actually attain your financial goals. The blog is by Dev Ashish, a Registered Investment Advisor by SEBI. Ashish is also an established investor and uses his blog to provide you with advice on how to manage your personal finances. In addition to personal finance management, the website also provides retirement planning advice. Summary: Big Law Investor suits you if you are either a law student or a practicing lawyer. The blog is authored by a New York City-based lawyer. It is about educating and creating a community of lawyers who often receive huge paychecks but are unsure of how to invest or manage their funds. The blog is mainly directed towards law students, but the information provided is valuable for people with all sorts of backgrounds. I would personally recommend Abnormalreturns.com out of the ones you’ve listed. Thank you for including DivHut in your list. I am definitely not “Australian” but I am of the Austrian Economic mindset. Will look into it, thank you for pointing it out! I wonder where I got the impression of you being an Australian. apologies, will fix it. Fantastic article! but, I think InvestorGod.com is worth mentioning since, he offers valuable information. I’ll be sure to look into them and add them in my future round-ups if I deem them applicable. Comment:Great article.. Make wise investments..
You are spot on. Several blogs mentioned on the list contains high-quality content. I am grateful you have shared such an amazing post. 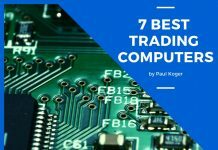 Great list of investing blogs. Very useful article. 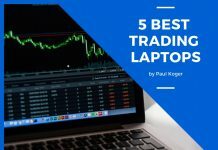 The blog is really very resourceful; the listicle is very help full for the people planning to invest and the people who are investing already. The article is relevant for all the type of investors having different backgrounds and budget. The above article has on point information and it works as a mini investment guide for the investor. Thank you for sharing this unique & wonderful content. It’s informative & helpful.